Join us for an exquisite, nourishing, empowering retreat – just for women! Over 3 days and 3 nights at the beautiful Gymea Eco Retreat & Spa in Nthn NSW. We will drop into a place of nurturing, transformation and play. This is a unique retreat open to any woman, whether you have been on the path for many years or have never been to a workshop, let alone a retreat. 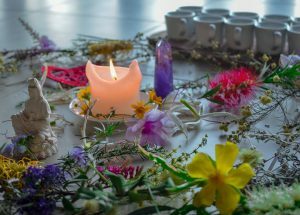 This is not just ‘another women’s retreat’ – we are going dive into a range of profoundly transformational practices to activate and awaken your connection to Self and experience the frequency of the embodied Feminine in form. There are many beautiful processes on offer during this retreat and also plenty of free time to play, swim, walk, have a spa treatment or shamanic healing treatment. There is time to reflect, journal, connect – whatever you need for your self-care. This is an extraordinary opportunity to really nurture yourself, recharge and take some time out. Catering by the gorgeous and talented Angie Cowen from Love, Life & Gluten Free. Click here to check out her recipe books. We are so excited to have Angie on board with us for this journey – high quality, mindful & lovingly prepared food is such an important component of retreat-world! And of course, fun! And laughs. And silliness. All activities are optional but highly recommended for the full experience. Facilitators are experienced in their craft – you will be held in a safe, loving container. To book in for the Alchemy Retreat fill out the Registration Details form and email to info@embodywellbeing.org. Rooms are twin share but a room by yourself may also be requested – indulge in king size bed in your own room for additional cost of $144 for the retreat. Please contact us to book any of the Alchemy Extras and for more information: info@embodywellbeing.org. A deposit of $500 is required to secure a place – full payment must be received by 8 March 2019 unless otherwise organised. Bookings also close 8 March 2019. Please note – places are limited for this special retreat. Payment plans are available on request. ​Booking for Alchemy: Please fill out the Registration Details form and email it to us at info@embodywellbeing.org. Refer to our Terms & Conditions document which outlines our refund policy. We will get back to you within in two business days to confirm a space at the retreat. 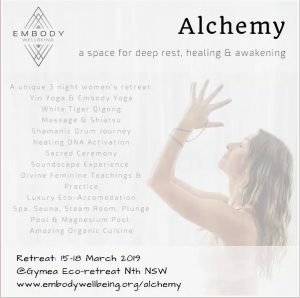 To secure your place at Alchemy Retreat – you will need to pay the $500 deposit into the account details provided on the Registration Details form and the full amount prior to 8 March 2019. What’s Included: Accommodation, food and activities are included in the retreat fee. Travel and transfers to Gymea are not included. Getting There: We can support organising transfers from Gold Coast Airport (OOL) if required. Car pooling is also encouraged – we will help to connect women up coming from similar areas. Please contact us if you would like to offer your car for car pooling, would like to share a ride and don’t want to drive, or require support coordinating a transfer from Gold Coast airport. ​Click here for further information on getting to Gymea. Please click here for suggestions on what to bring and additional details and considerations to help you prepare before and after the retreat. Get in touch with us for more information or if you have any questions: info@embodywellbeing.org. We are so excited about this offering and would love to talk to you if you have any queries or concerns.